You could substitute with vanilla extract or vanilla flavor if vanilla beans are not readily available in your area. Short directions or step-by-step instructions. Mix vanilla seeds with the sugar. Combine cream and milk, then add 1/2 of the vanilla-sugar to that mixture and stir. 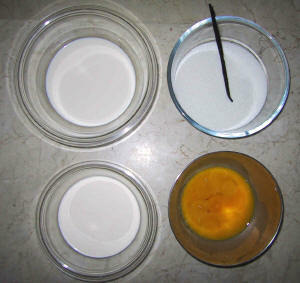 Mix the other half of the sugar to the egg yolks. Bring the cream-milk-sugar mixture to a boil. Temper and combine yolks with the boiling milk. Put saucepan back onto flame and cook until it coats the back of a spoon or until the mixture reaches 170 F.
Strain into a bowl over ice. Make this recipe by following the step-by-step instructions!